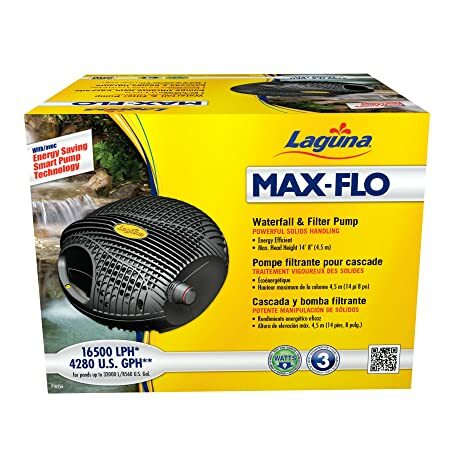 The Laguna Max-Flo 2900 Waterfall & Filter Pump is designed to circulate water loaded with moderate amounts of solid particles (or solids) and transport them to suitable external filter systems (including pressurized filters) which then trap debris that could potentially pollute pond water, effectively filtering the pond. Max-Flo is ideal for use with filtration systems and for creating waterfalls and watercourses. Easy to install and operate, the pump is completely submersible and engineered to run continuously. Laguna Max Flo solids handling pumps are powered by a magnetic-driven motor that is unmatched in the market for its ability to generate powerful and continuous water flow while consuming minimal electricity-the perfect combination of high pump efficiency and low energy costs. The Max Flo 2900 pump features a new generation of Smart Pump Technology (SPT), an integrated self-regulating system that continuously monitors the pumps performance, impeller direction, hydraulics and force, resulting in one of the most powerful, energy efficient pumps you can buy. Easy to install and featuring Click-Fit Fast Couplings with outlet diameters of ” 1″, 1 “, the Max-Flo 2900 can handle solids up to 5/16” in size and is good for ponds up to 5800 US Gallons. The pump is manufactured in Italy and guaranteed for 3 years. Laguna is dedicated to beautifully simple water gardening. These high quality, high efficiency pumps are designed for easy installation and long lasting, worry-free performance.Laguna Max-Flo pumps are designed to provide continuous and reliable water circulation. They are ideally suited for a variety of pond applications, such as providing water flow to filtration systems and creating spectacular waterfalls. The pumps are powered by a magnetic-driven motor that’s unrivaled in the market for generating large amounts of water flow at extremely low energy costs. This is great news for people who are wary of costly electricity bills. 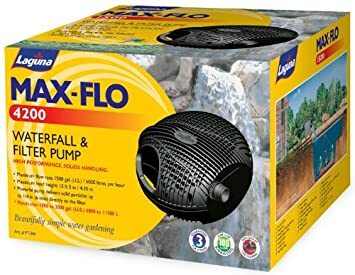 In fact, switching to a Laguna pump will often pay for itself in as little as one season.Max-Flo pumps are suitable for multiple pond applications, such as providing water flow to filtration systems (pressurized filters, surface skimmers) and creating spectacular waterfalls. Specifically designed to provide continuous and reliable water circulation, Max-Flo pumps process water loaded with moderate amounts of suspended solids and transport them to suitable external filter systems which then trap any debris that could potentially pollute pond water, effectively filtering the pond. They are completely submersible and designed to run continuously in fresh water, for years of trouble-free operation.Laguna Max-Flo 600/900/1500/ Waterfall & Filter PumpLaguna Max-Flo 600/900/1500 Waterfall & Filter Pumps are designed to process water loaded with moderate amounts of solid particles and transport these suspended solids to suitable external filter systems (including pressurized filters) which then trap any debris that could potentially pollute pond water, effectively filtering the pond. The uniquely-shaped pump cage allows the passage of solids sized up to 1/4 inch. As always, the pump motor is unequalled in the pond industry for its ability to generate an astounding amount of water flow reliably and continuously at low energy-efficient costs. The pumps are ideal for use with filtration systems and for creating waterfalls and streams.Laguna Max-Flo 2000/2400/2900/4200 Waterfall & Filter PumpThe Laguna Max-Flo 2000/2400/2900/4200 Waterfall & Filter Pumps are designed to process water loaded with moderate amounts of solid particles (or solids) and transport these suspended solids to suitable external filter systems (including pressurized filters) which then trap any debris that could potentially pollute pond water, effectively filtering the pond. The uniquely-shaped pump cage allows the passage of solids sized up to 5/16 inch. As always, the pump motor is unequalled in the pond industry for its ability to generate an astounding amount of water flow reliably and continuously at low energy-efficient costs. The pumps are ideal for use with filtration systems and for creating waterfalls and streams. Max Flo Features1. Easy to carry handle2. Delivers solid particles up to 3/8-inch directly to the filter3. Universal Fast Coupling for 3/4-inch, 1-inch & 1-1/4-inch diameter hosing.4. Fast Coupling for 1-1/2-inch diameter hosing Pump Installation General Information Since the MaxFlo Pump has ability to process water that is moderately loaded with suspended solid particles, the MaxFlo pump is ideal for use with most all filtration systems. The pumps are ideal to transport suspended solids to a Laguna PressureFlo filters which then traps any debris that could potentially pollute pond water, effectively filtering the pond. The pumps are not suitable for supplying water to fountainheads, because the fountainhead jets could easily become clogged by solids processed by the pumps.The pump motor sits inside a uniquely-shaped cage that is designed to allow the passage of solids up to a determined size only (from 6 mm to 8 mm depending on the model), as bigger solids may clog and damage the pump. The pump must never be used without its cage.For improved operation, place the pump in the deepest part of the pond. At minimum, it must be placed at a depth of 8 inches. If necessary, you can secure the pump to a fixed base by using the keyhole-shaped slots, located at the bottom of the cage, which are shaped to allow the fast engaging/disengaging of the pump from the base. The electrical cord must be protected against any objects that may potentially damage it. The electrical receptacle/socket must be located in a dry, protected and easily accessible place.Installation 1. Electrical Outlet 2. Transformers 3. PowerClear UV Sterilizer / Clarifier 4. PowerFlo External Filter 5. PowerFlo Light 6. Max-Flo Pump 7. Non-Kink Hosing Pump Care Maintenance is essential and simple to carry out Once a week, verify that the pump performance is satisfactory. If you detect a drop in pump performance (such as a decrease in water flow from the pump or to the waterfall) first clean the Pump Cage and the hosing. If the water flow is still not fully restored to its original performance, clean the Impeller, Impeller Well and Impeller Cover. The Pump Cage must be cleaned at least once a month.When necessary, or at least once a year, clean the pump motor completely (Impeller, Impeller Well, and Impeller Cover) and check that no limestone deposits, which could jeopardize pump operation, are present.To keep the pump in good working order, always replace any worn parts.The pump motor has no user serviceable parts. If the motor or the electrical cord is damaged, discard the pump.TroubleshootingLow flow from the pumpCheck that the pump cage is clean. Check the hose for blockages. Check that the pump is free of dirt and debris. No flow from pumpCheck that the power supply is on. Check the fuse and wiring. Check that the plug is correctly connected to the electrical receptacle/socket. Check that the pump cage is clean. Check the hose for blockages. Check that the pump is free of dirt and debris. Check that the pump is completely immersed in water.. Made in Italy Warranty The Pumps are guaranteed against defects in material or workmanship for a period of 3 years from date of purchase, under normal usage. PowerJet Pumps will be repaired or replaced at manufacturer’s discretion, free of charge. This warranty does not apply to any PowerJet Pump which has been subjected to misuse, negligence, tampering or accidental damage to the impeller or impeller shaft. No liability is assumed with respect to loss or damage to livestock or personal property irrespective of the cause thereof. This warranty does not affect your statutory rights. Failure caused by misuse is not covered by this warranty. 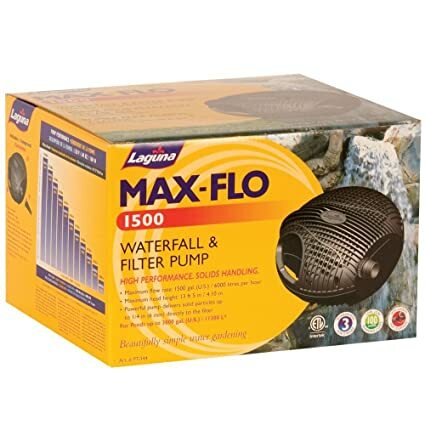 Laguna Max-Flo 600 Waterfall & Filter Pump is designed to circulate water loaded with moderate amounts of solid particles (or solids) and transport them to suitable external filter systems (including pressurized filters) which then trap debris that could potentially pollute pond water, effectively filtering the pond. Max-Flo is ideal for use with filtration systems and for creating waterfalls and watercourses. Easy to install and operate, the pump is completely submersible and engineered to run continuously. Laguna Max Flo solids handling pumps are powered by a magnetic-driven motor that is unmatched in the market for its ability to generate powerful and continuous water flow while consuming minimal electricity-the perfect combination of high pump efficiency and low energy costs. Easy to install and featuring Click-Fit Fast Couplings with outlet diameters of ” 1″, 1 “, the Max-Flo 600 can handle solids up to 1/4” in size and is good for ponds up to 1200 US Gallons. The pump is manufactured in Italy and guaranteed for 3 years. 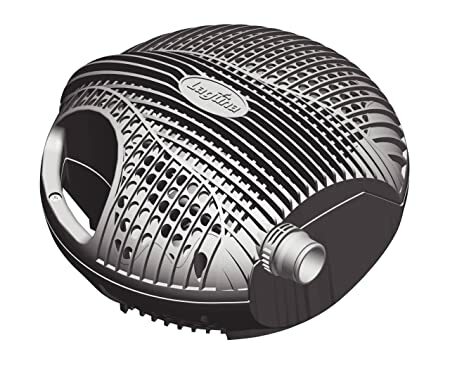 The Laguna Max-Flo 2400 Waterfall & Filter Pump is designed to circulate water loaded with moderate amounts of solid particles (or solids) and transport them to suitable external filter systems (including pressurized filters) which then trap debris that could potentially pollute pond water, effectively filtering the pond. Max-Flo is ideal for use with filtration systems and for creating waterfalls and watercourses. Easy to install and operate, the pump is completely submersible and engineered to run continuously. Laguna Max Flo solids handling pumps are powered by a magnetic-driven motor that is unmatched in the market for its ability to generate powerful and continuous water flow while consuming minimal electricity-the perfect combination of high pump efficiency and low energy costs. The Max Flo 2400 pump features a new generation of Smart Pump Technology (SPT), an integrated self-regulating system that continuously monitors the pumps performance, impeller direction, hydraulics and force, resulting in one of the most powerful, energy efficient pumps you can buy. Easy to install and featuring Click-Fit Fast Couplings with outlet diameters of ” 1″, 1 “, the Max-Flo 2400 can handle solids up to 5/16” in size and is good for ponds up to 4800 US Gallons. The pump is manufactured in Italy and guaranteed for 3 years. The Laguna Max-Flo 4280 Waterfall & Filter Pump is designed to circulate water loaded with moderate amounts of solid particles (or solids) and transport them to suitable external filter systems (including pressurized filters) which then trap debris that could potentially pollute pond water, effectively filtering the pond. Max-Flo is ideal for use with filtration systems and for creating waterfalls and watercourses. Easy to install and operate, the pump is completely submersible and engineered to run continuously. Laguna Max Flo solids handling pumps are powered by a magnetic-driven motor that is unmatched in the market for its ability to generate powerful and continuous water flow while consuming minimal electricity-the perfect combination of high pump efficiency and low energy costs. The Max Flo 4280 pump features a new generation of Smart Pump Technology (SPT), an integrated self-regulating system that continuously monitors the pumps performance, impeller direction, hydraulics and force, resulting in one of the most powerful, energy efficient pumps you can buy. Easy to install and featuring Click-Fit Fast Couplings with outlet diameters of ” 1″, 1 “, the Max-Flo 4280 can handle solids up to 3/8” in size and is good for ponds up to 8560 US Gallons. The pump is manufactured in Italy and guaranteed for 3 years. Laguna Max-Flo 960 Waterfall & Filter Pump is designed to circulate water loaded with moderate amounts of solid particles (or solids) and transport them to suitable external filter systems (including pressurized filters) which then trap debris that could potentially pollute pond water, effectively filtering the pond. Max-Flo is ideal for use with filtration systems and for creating waterfalls and watercourses. Easy to install and operate, the pump is completely submersible and engineered to run continuously. Laguna Max Flo solids handling pumps are powered by a magnetic-driven motor that is unmatched in the market for its ability to generate powerful and continuous water flow while consuming minimal electricity-the perfect combination of high pump efficiency and low energy costs. Easy to install and featuring Click-Fit Fast Couplings with outlet diameters of ” 1″, 1 “, the Max-Flo 960 can handle solids up to 1/4” in size and is good for ponds up to 1920 US Gallons. The pump is manufactured in Italy and guaranteed for 3 years. 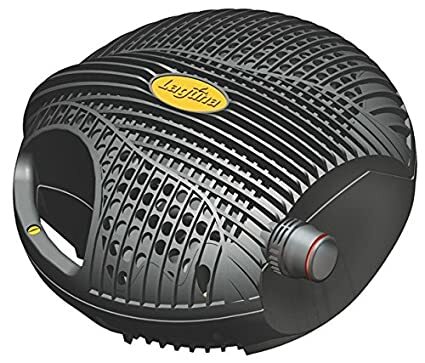 The Laguna Max-Flo 2000 Waterfall & Filter Pump is designed to circulate water loaded with moderate amounts of solid particles (or solids) and transport them to suitable external filter systems (including pressurized filters) which then trap debris that could potentially pollute pond water, effectively filtering the pond. Max-Flo is ideal for use with filtration systems and for creating waterfalls and watercourses. Easy to install and operate, the pump is completely submersible and engineered to run continuously. Laguna Max Flo solids handling pumps are powered by a magnetic-driven motor that is unmatched in the market for its ability to generate powerful and continuous water flow while consuming minimal electricity-the perfect combination of high pump efficiency and low energy costs. The Max Flo 2000 pump features a new generation of Smart Pump Technology (SPT), an integrated self-regulating system that continuously monitors the pumps performance, impeller direction, hydraulics and force, resulting in one of the most powerful, energy efficient pumps you can buy. Easy to install and featuring Click-Fit Fast Couplings with outlet diameters of ” 1″, 1 “, the Max-Flo 2000 can handle solids up to 5/16” in size and is good for ponds up to 4000 US Gallons The pump is manufactured in Italy and guaranteed for 3 years. Laguna Max-Flo 1350 Waterfall & Filter Pump is designed to circulate water loaded with moderate amounts of solid particles (or solids) and transport them to suitable external filter systems (including pressurized filters) which then trap debris that could potentially pollute pond water, effectively filtering the pond. Max-Flo is ideal for use with filtration systems and for creating waterfalls and watercourses. 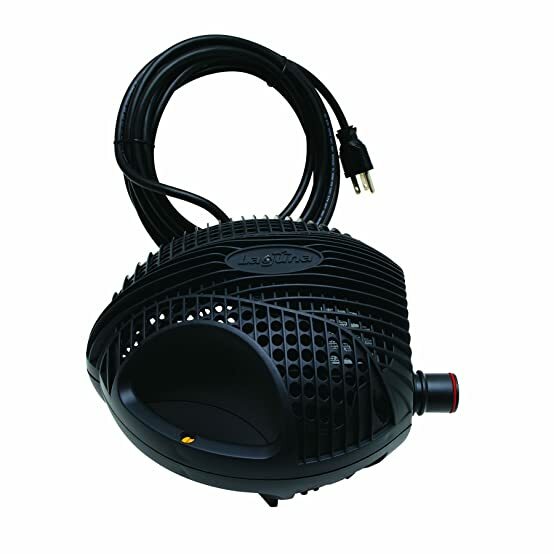 Easy to install and operate, the pump is completely submersible and engineered to run continuously. Laguna Max Flo solids handling pumps are powered by a magnetic-driven motor that is unmatched in the market for its ability to generate powerful and continuous water flow while consuming minimal electricity-the perfect combination of high pump efficiency and low energy costs. Easy to install and featuring Click-Fit Fast Couplings with outlet diameters of ” 1″, 1 “, the Max-Flo 1350 can handle solids up to 1/4” in size and is good for ponds up to 2700 US Gallons. The pump is manufactured in Italy and guaranteed for 3 years.